Russian Poot Man has contributed to 14 posts out of 468616 total posts (0.00%) in 196 days (.07 posts per day). Install Halo again, download the 1.09 patch, install that. Keep that Halo in a folder inside your main Halo folder. I had to do this for the recorded animation stuff to work. When I run build-cache-file with tool, it saves a .map file but the icon has a small lock over it. I cannot see the file under my normal file explorer but I can see the file when I use Guerilla to open file. Anyone know why this would happen? 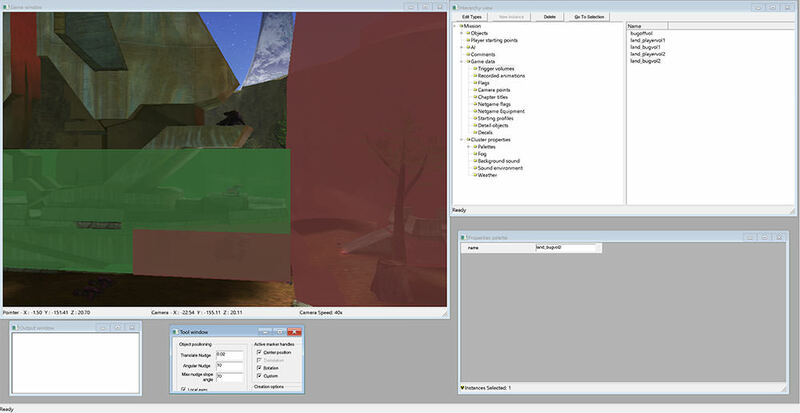 Not exactly sure whats happening, but I would make sure your hek tools are set to run as admin, and I would check your program files directory under microsoft games to see if Halo saved any of your stuff there, as this has been an issue for users in the past. Thanks, glad people are showing interest. I made an update, but the scripts are getting too long and need to be rewritten again. This is what I meant by the override, the buggers will always want to fly after a second or two in combat, but when both the player and bugger are in the their detect volumes, the bugger might decide to land. He can also choose to fly again. Need to work out some kinks, but some kinks might become a feature. Edit: The bugger being able to choose flight inside the area its meant to land could actually be helpful in some cases, the bugger could unstick himself or fly to place closer to where he should be. With some adjustments and parameters, this could iron out quite nicely. I tried making them walk on every surface, but it ended up looking terrible, I think this is a tag issue. I'd like the buggers to walk on walls too. I tried that again when I was filming the vid, but it still didn't really work, but it did help them get over those warthogs. I could try to get that flinging to surface idea working. I also fixed a collision bug in the flying bugger. Made an update. I rewrote everything and made it support encounters instead of named objects. Working on refining and getting the buggers to fly when its best for combat, and also when they want to. Also now their health isn't reset. Thats cool, thanks for showing. Glad you're interested. Edit: I've made some updates to this. Now it looks nearly flawless, and the bugger can somewhat land in combat. Still working on making the bugger land in combat when necessary everywhere, not just rooms. I can make him wait before deciding to fly when in combat, make him decide what to do based on player location, with bigger trigger volumes. Edit3: I got him to switch during combat. It also looks way better now. Uploading vid. I found a way of overriding the behavior and giving the AI more of a preference. For example: If the player is in a hard to reach area from above, the bugger may decide to land and go after you on foot. Working on implementing this for the next vid. I got the tags from thros's maps. I used default halo and split the bugger into two bipeds, one for the air and ground. I attach and detach them with my primitive scripts when necessary. This time I attach them differently, because they were having collision issues before, the tag has some issues, so my attach method now looks worse, but functions as intended. I just threw this together and it worked, it could be vastly improved. This could look pretty much flawless if the bugger coll was fixed. Edit: It would be ideal if we could find a way to make the ground bugger fall slower. It's not top priority for me, but it would look better. I want to get the ground bugger to move right, and it has trouble navigating. I feel like this tag could be improved. Made an update. Now the bugger can land. He can switch back and forth whenever now. interesting I didn't know that was possible, great job. Has anyone done this before? Halo doesn't support characters that can fly and walk, its one or the other, so I made this. Its WIP but I think Halo can support this kind of thing fully with a little work. Made another update video. This time slightly improved. I could explain why a lot of the weirdness happens, but it's late and I'm tired. It's all stuff that I'll fix in the recode. Hope to see it working, good luck. I edited the main post before I saw your response, I was thinking the same. If you update the rotation, then the locally ran AI attached to the server biped has a greater chance of making the same decision. That's also true, you have a bunch of other variables like fleeing and berserk, or if the unit is in a vehicle. If somehow object names could be carried over to the client, some of these variables could be accounted for with map scripts. When I took those variables away, the client side attached AI matched the server very well most of the time. That's why I was curious about the initial simple position update. EDIT: I discovered more and have a bigger update video in progress. Now I can see my idea in action. Ignore the laggy sentinel, the client thinks player movement is disabled blah blah it doesn't matter. This time the real position is being updated. The problem now is that the server biped has a big fat player covering part of his body, causing his AI to act differently. The client AI doesn't see this, and seems to have a twitching issue. I know this could be vastly improved. This is a follow up thread to my post about server side bipeds. There is zero use of client side bipeds in this, meaning no duplicate fake client created objects. Instead of syncing animation data, why not sync just the position every couple seconds, while the client handles the rest with its own locally ran AI attached to the server biped. If you update the real position, and maybe the rotation depending on how well it works, of the server biped for clients, the AI can simply try again if the position goes out of sync. That didn't happen in the video, but you know what I mean. my question to all the scripters out there is, would it be possible for clients to name these server side bipeds so they can be manipulated, and have them do all the animation stuff while your scripts update their real position? Time: Sat April 20, 2019 9:23 AM 656 ms.